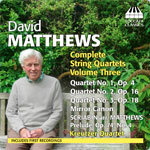 This third volume of David Matthews’s music for a string quartet is of interest in featuring the first three of his acknowledged works in the genre, the first two of which are only now appearing on disc and together offer numerous insights into the composer’s formative years. Not that there is anything tentative or immature about the First Quartet (1970), is any case preceded by four now discarded such pieces, though its highly expressionistic language may surprise those familiar only with Matthews’s later work. The composer identifies the presence of Schoenberg’s and Nicholas Maw’s First Quartets (the latter a neglected masterpiece urgently in need of revival), whose multi-faceted single movements most likely influenced his decision to overhaul the piece 12 years later - telescoping his two movements so that an unbroken continuity resulted. What is now the opening half juxtaposes a sustained Adagio with more energetic material, out of which emerges a theme which is restlessly transformed across what follows before its culminating statement as an impassioned chorale. By contrast, the Second Quartet (1976) is in three sharply differentiated movements. Titled ‘Sonata’, the first of these is a tensile example of the form whose propulsion is as ceaseless as it is unyielding, while the ensuing ‘Scherzo’ predicates rhythmic over harmonic and melodic concerns in its trenchant progress: Matthews has suggested the influence of rock bands The Who and The Velvet Underground in this respect, and if his piece is respectively less visceral and less mesmeric than either, it still packs a fair punch. Best, though, is the final ‘Elegy’ – a tribute to a victim of the 1974 Paris air disaster - whose single theme appears three times to ever more intricate and heightened effect, marked off by interludes in which the presence of insect sounds heard in Australia imparts a Bartókian remoteness to the prevailing plangency. It is an arresting piece, though there is little doubt that with the Third Quartet (1978) Matthews attained full mastery in the medium. Again there is a single movement but the overall trajectory admits of no disjunctiveness in its follow-through. Thus the initial Allegro is a concentrated sonata design whose formal clarity and expressive poise are carried over into the Andante, an intermezzo whose oblique progress is compounded by spectral, then strident, scherzo interludes; and which, in its turn, leads into a Largo whose main theme fashions the opening motif into a theme that sees the work through to its subdued yet eloquent close. An impressive work, then, that amply justifies the plaudits it has received and which, albeit in retrospect, can rank among the finest string quartets (British or otherwise) from the period.